Convenient location, easily accessible to the old city. Clean and modern apartment. Quiet and comfy! We will recommend! DBA apartment located in very good location, closed to pile gate. The apartment is modern, fully equipped same as the pictures in website. Ana is very helpful, quick response and well manage. It was lovely, tastefully decorated, spacious and well located. Expensive but not out of line with similar properties in Dubrovnik. The apartment was conveniently located in a walking distance from the old town entrance, given that you have to carry your luggage through. The interior was stylish, well kept and comfortable. What also made it special was having a personalized book guide that refers you to the places where the locals eat, gives you some insider tips, recommendations on sites to visit and others. Vicko who assisted us in checking in and recommended some nice places to dine was helpful and welcoming. As well as Ana whom I was in touch with for our request to extend the early 10am check-out time was very efficient and supportive. Thank you for your wonderful hospitality. everything was amazing. Apartment was out of this world and in a fab location. No view from the bedroom but that didn't matter at all. I didn't travel to stay in the bedroom. Dubrovnik, the country, the people, the food, the host...AMAZING!!! Spacious apartment right off the Stradun. Historical sights, restaurants and shops are all within a few blocks. Ana met us on arrival and was helpful with recommendations, etc. Juice, fruit and coffee on arrival were very much appreciated. The place was large and modern. It had a very comfortable bed and large closet. The living room was large and so was the sofa. The kitchen had all utensils needed and there was water and tea in the refrigerator for us. The A/C worked well and the room had windows with plenty of light. The unit had all we needed for our stay: a comfortable bed, clean bathroom with nice shower, large sofa and TV. Location is in the old town which is easy to go anywhere. The owner Ana is friendly and helpful. Location was excellent in old town & close to Pile gate. 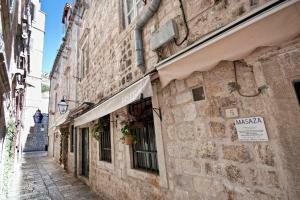 Lock in a great price for Dubrovnik Boutique Apartments – rated 9.1 by recent guests! 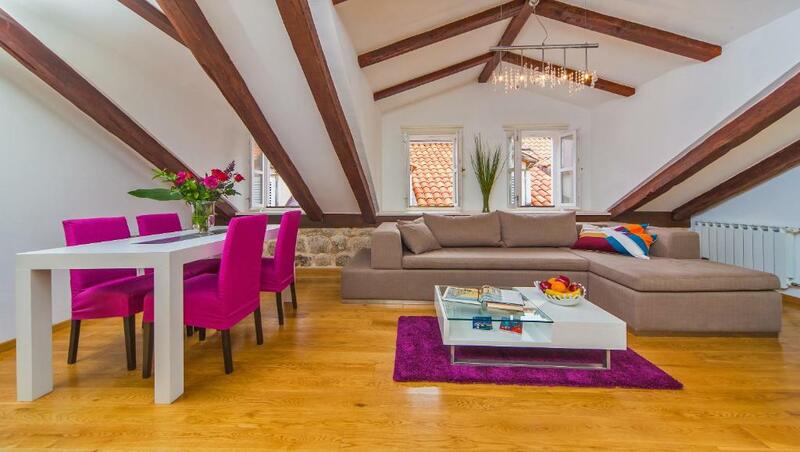 Dubrovnik Boutique Apartments This rating is a reflection of how the property compares to the industry standard when it comes to price, facilities and services available. It's based on a self-evaluation by the property. Use this rating to help choose your stay! Set in the heart of the UNESCO-protected Dubrovnik Old Town and only 250 feet away from the entrance to the well-known Walls of Dubrovnik, Dubrovnik Boutique Apartments provides air-conditioned accommodations. Free WiFi access is provided. Spacious apartments here are decorated in a blend of contemporary style with modern amenities and traditional 18th century stone wall elements, as well as wooden beams. Each provides a seating area with a sofa and a flat-screen cable TV. A fully equipped kitchen with an induction stove top is available. The private bathrooms are fitted with a shower. Guests can enjoy breakfast 100 feet away, in Cafe Festival located on the Stradun promenade. Dubrovnik Boutique Apartments are located only steps from the Stradun Promenade, featuring a variety of restaurants, café bars and shops. The property is across the street from the Franciscan Monastery, home to one of the oldest still-running pharmacies in the world. The pebbly Banje Beach, offering a view of the City Walls and the Old Dubrovnik Port, is 2,300 feet away from the apartments. The Buža Bar and a rocky beach just beside the City Walls can be visited within 1,150 feet. A cable car leading to Mountain Srđ, where panoramic views of Dubrovnik and the Mediterranean Sea can be enjoyed, is also 1,650 feet away. The Old Port is 1,000 feet away from the apartments, and a tourist boat leading to the picturesque island of Lokrum can be found there. Dubrovnik Ferry Port and the Main Bus Station are easily reachable by local busses, within 1.9 mi. Dubrovnik Airport is 12 mi away. When would you like to stay at Dubrovnik Boutique Apartments? This air-conditioned apartment is located on the first floor and decorated in a combination of traditional stone and wood elements and modern decor. It consists of a seating area with a sofa and a flat-screen cable TV. There is a fully equipped kitchen. The private bathroom is fitted with a shower. This spacious air-conditioned apartment is located on the second floor and decorated in a combination of traditional stone and wood elements and modern decor. It features 4-yard-high ceilings and consists of a seating area with a sofa and a flat-screen cable TV. There is a fully equipped kitchen. The private bathroom is fitted with a shower. This air-conditioned apartment is located on the third floor and decorated in a combination of traditional stone and wood elements and modern decor. It consists of a seating area with a sofa and a flat-screen cable TV. There is a fully equipped kitchen. The private bathroom is fitted with a shower. Please note that the address of this apartment is: Petilovrijenci Street 4. Apartments Stradun are located just few steps from the main Dubrovnik street Stradun. Unlike most of the properties in Dubrovnik, especially in Old Town, to reach our apartment building there are literally no steps. However, please take in consideration, there are 3 floors to climb within the building, depending which apartment you have booked. The apartment building is originally around 400 years old with all the original elements houses had at that time, such as stone walls, wooden beams, chimney on attic floor, etc. Also, to make our guests more comfortable, each of you are getting free fruit basket and cold refreshments in your fridge upon arrival. Looking forward to meet you, Andrea. 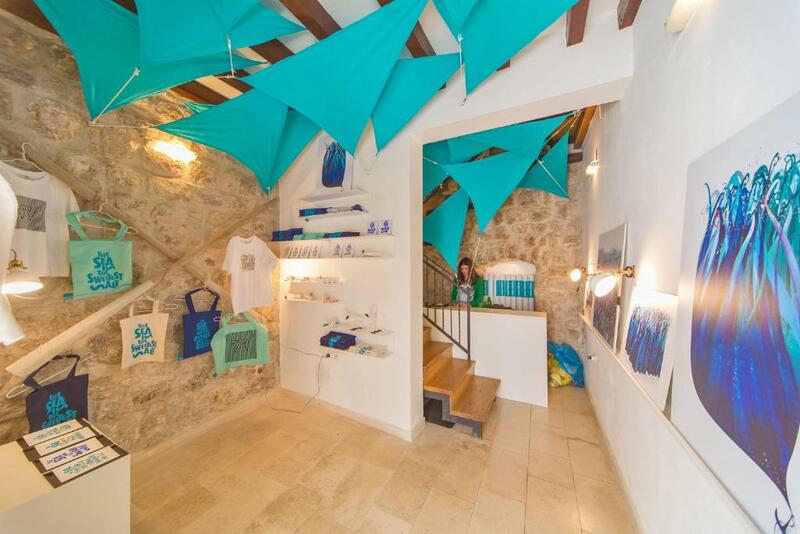 House Rules Dubrovnik Boutique Apartments takes special requests – add in the next step! Please inform Dubrovnik Boutique Apartments of your expected arrival time in advance. You can use the Special Requests box when booking, or contact the property directly using the contact details in your confirmation. Andrea, the apartment manager, is so helpful and very thoughtful. Great location, very accommodating host. Ran out of hot water in the shower. Great location within the old town walls, close to the main sites, shops, restaurants and cafes. Nicely decorated apartment. Excellent apartment with great location and fully equipped. The place is cosy and with high quality furniture. Everything very well thought. ADDRESS ON THE CONFIRMATION WAS DIFFICULT TO FIND AS THE HOTEL IS IN THE OLD TOWN SQUARE , WHILE CARS CAN NOT ENTER . The bathroom smelled a bit drainy after 3 days into our stay. The description said that toiletries were provided, but these were minimal. There was some fresh fruit, but the tea and coffee ingredients were past their best. Perfect location and very good hosts. The apartment is nicely presented and comfortable to relax in. The cooking facilities were good too. Bathroom was a bit funky and air conditioner was in living room but not bedroom. Great location. Friendly host. Helpful materials to support visit. Fruit basket on arrival. Slight smell was the only problem. The view was of someone else's living room, and having the only form of payment be cash can be inconvienent. We had to max our daily amount to withdraw from an ATM on one card, and use a little of our other bank account to pay for the room. I know, we should have read that it was cash only...but it's 2018...who doesn't take credit? Very comfortable, and hostess was accommodating. Everything was perfect, there was nothing I had disliked about the apartment. I loved everything that this apartment had to offer. The location was close to all cultural and historic sites of Dubrovnik. Also, the apartment itself was spacious, very clean, had high quality linen and had modern kitchen facilities which was brilliant. Ana was also fantastic at organising everything for us - so thank you for making our stay so wonderful.